This Heavy-Duty Winder wave bike rack differs from the Heavy-Duty Challenger by it's height, which provides sufficient clearance for the bike seat, and easier loading from either side. 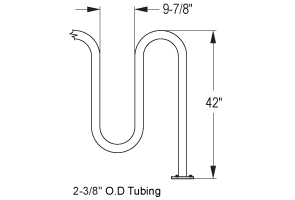 This wave bike rack's hefty frame is constructed from a 2" Schedule 40 pipe. It is well suited for even the most harsh environments and allows the use of high security U-Locks to secure the frame of the bike to the wave bike rack. The racks are offered in a galvanized, powder-coated, and stainless steel finish. 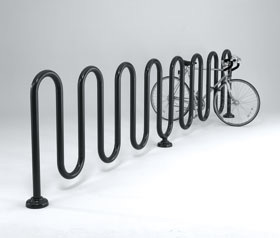 The Heavy-Duty Winder wave bike racks come in various lengths up to 21-bike capacity to maximize your bike storage and are available in in-ground and surface mount. Drop In Anchors available for concrete installation.